Carrick United reached their second major final of the season when they handed out a 3-0 lesson to Village United at Turner’s Cross in the semi-final of the Lucozade Sport Munster Junior Cup on Saturday night. Village, in the face of one of the best ever first half displays by a visiting side at the Cross, defied the odds for thirty minutes. One nil wouldn't have been too bad at the break but it became two nil shortly before it and the Cork side’s chances of a revival were dashed by a third early in the second half as Carrick, already though to the FAI Junior final, booked their date with neighbours Clonmel Town in the provincial decider. 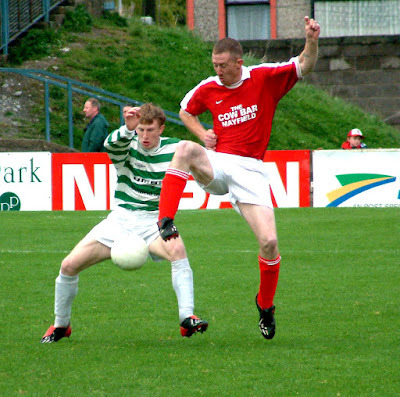 The Cork team have played impressively in many games this season, distinguishing themselves in both the Munster and FAI Cups. But they have never come up against a team as good as the Waterford league visitors. Power and pace, long balls, shorts ball, intelligent running off the ball, high fitness levels, tight discipline, control and vision, the visitors had it all and how the Village goals stayed intact for thirty minutes is something of a mystery. But skipper Conor Jones led a defiant defence and keeper Jamie O’Donovan again did well as wave after wave of well organised attack threatened to overwhelm them. Village themselves had the odd raid but generally the first half traffic was in one direction. 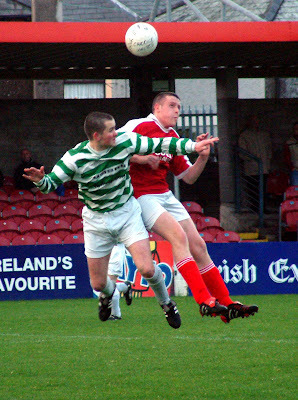 In the very first minute, Carrick had penalty claims as the outstanding Thomas Fitzgerald went down in the box. 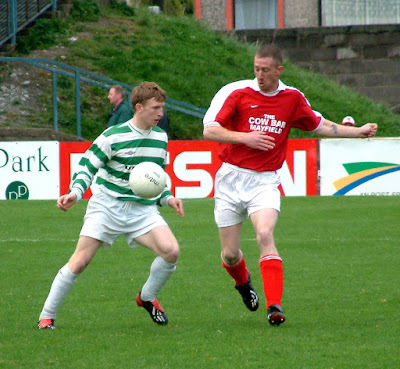 Two minutes later, Village gave the ball away in midfield and Anthony Power raced away but drove just over. In the 5th minute, a terrific crossfield ball by striker Thomas Fitzgerald split the Village defence but the powerful shot by incoming Keith Walsh sped just over. 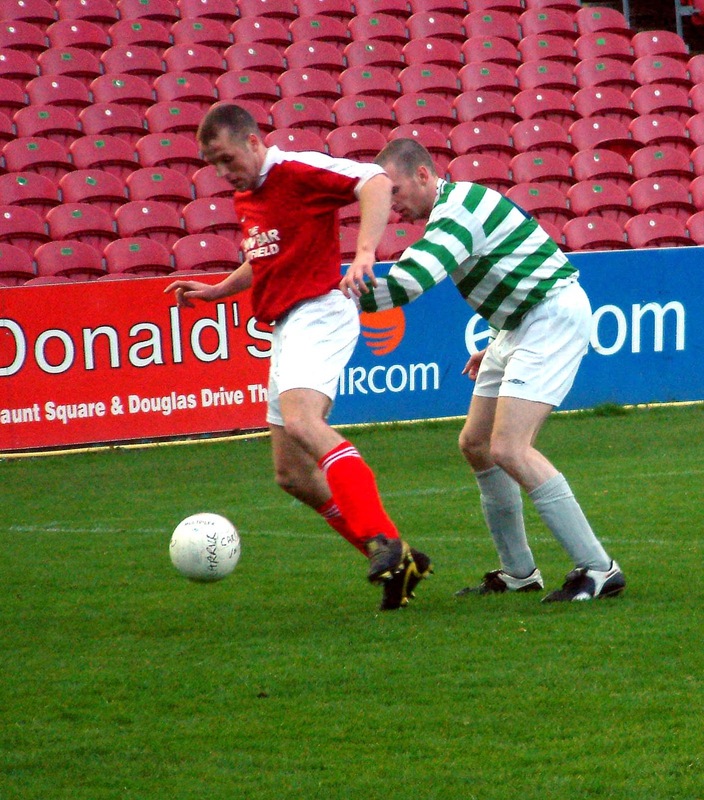 Village had a rare raid in the 8th minute when Richard Burns sent Jinty O'Sullivan up the right. He tried a snap shot from a narrow angle and almost surprised keeper Adrian Walsh. Soon it was business as usual. In the 11th minute, Power’s corner ball came back to him and his second cross found the head of Fitzgerald and this effort went behind off the foot of the post. The Village luck held again in the 18th minute. Again Fitzgerald was at the heart of the move. He set up Power who in turn crossed into the box where the unmarked Kavanagh was flying in. But he drove his shot against the bar. Alan Ryan latched onto the rebound but somehow O’Donovan changed direction and dived on the ball. And O’Donovan made another brilliant save in the 29th minute. Then Fitzgerald broke behind the defence as a long free by Kevin O’Shea came over the top but he found the keeper at his feet before he could get his shot away. The breakthrough came on the half-hour mark and owed much to some impressive close control in the box by Kavanagh. He eventually laid the ball to his right to Alan Ryan and his angled rocket sped high past O’Donovan for the opener. Carrick made it 2-0 six minutes later. Then Fitzgerald picked up a pass in the box and his 15 yard drive was too strong, too well placed for O’Donovan. Village came close to cutting the deficit in the first minute of injury time. Richard Burns got a good ball in and sub Leslie Kepple got in behind Brian Barry but keeper Walsh advanced quickly and blocked the shot at close quarters. The Cork team took the game to Carrick for the opening minutes of the second half but got another warning when, in the 51st minute, Power came in at the end of a sweet passing move but shot well off target. The third came in the 58th minute. Following a throw ball on the attacking left, Fitzgerald got away, rather easily, from two markers and then lifted the ball across the 18 yard line for the incoming Keith Walsh to slam low past the advancing O’Donovan. It was all over now, for sure. Village battled gamely and forced a series of corners after a good Conan Burns shot had been deflected. 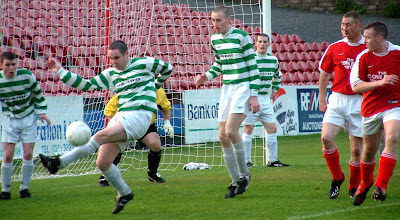 Village players Kevin Dunne (twice) and sub Brian Sheehan had shots on target but mainly from long range and none of which really tested keeper Walsh. Carrick had the job done and the second half was tame by comparison with the first. 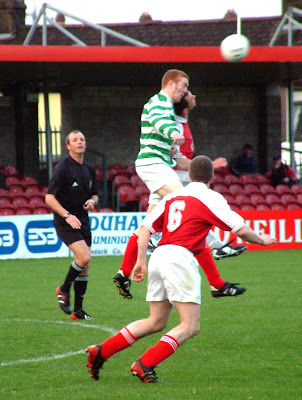 Midway though, Fitzgerald raced onto a poor back pass by Jinty O’Sullivan but the Village defence managed to hold him out and, a few minutes later, Ryan went close with a free kick. Carrick had done the damage in the first half and are now in with a chance of competing in a hat trick of major cup finals. They are also in the Munster Senior Cup and play Limerick's Pike Rovers in the semi-final with Cork City and Douglas Hall contesting the other side. 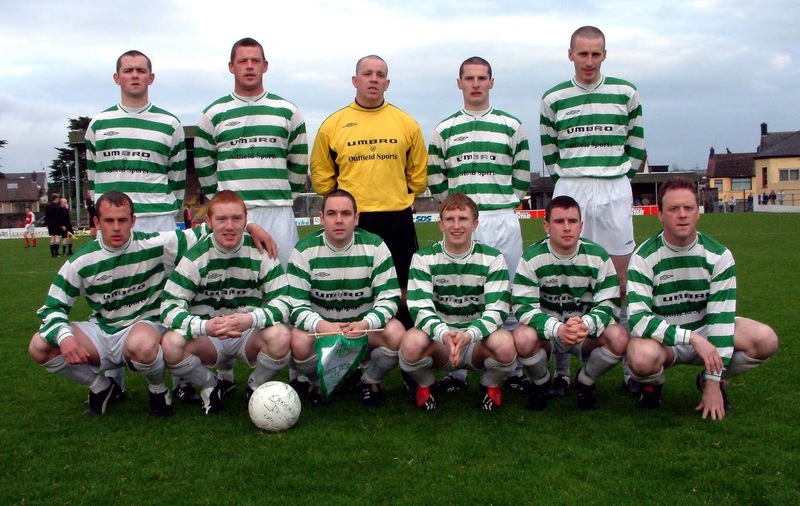 Village United: Jamie O’Donovan, Clive Hurley, Kevin Dunne, David Quirke, Conor Jones (captain), Terry Lotty, Eric Burns, Alan O’Brien, Richard Burns, Conan Burns and Jinty O'Sullivan. Subs used: Leslie Kepple for Hurley (39th minute), Brian Sheehan for O’Brien (52nd) and Kieran O'Callaghan for C. Burns (64th). 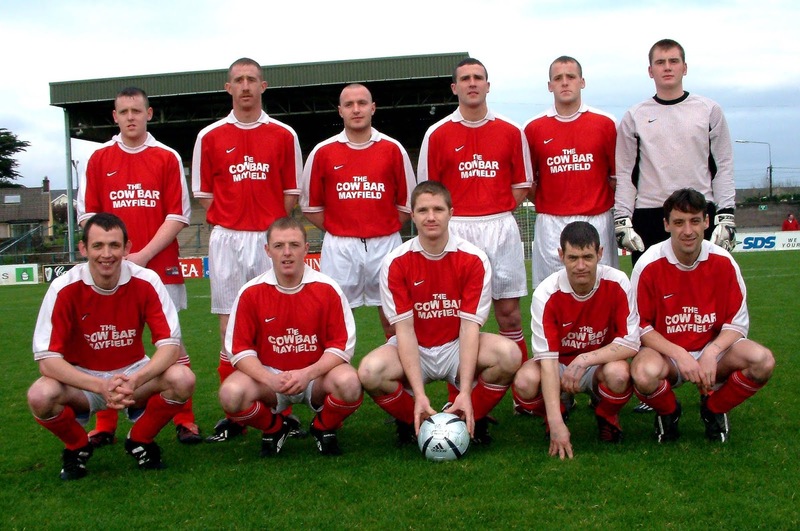 Carrick Utd: Adrian Walsh, James Walsh, Brian Barry, Anthony O’Donnell, Kevin O’Shea, Alan Ryan, Keith Walsh, Anthony Power, Thomas Fitzgerald, Tony Reale and Daryl Kavanagh. Subs used: Barry Murphy for Fitzgerald (72nd minute) and Gerard Walsh for Ryan (77th).